Do you create posters for personal or business use? Many people use Microsoft Word for this purpose, but PowerPoint offers more graphic features and greater flexibility in placing your text and images. Let’s create a couple of posters in PowerPoint 2007 or 2010. Note: At the end of this blog post, I give you a resource for downloading existing PowerPoint poster templates. I also offer a free download of templates for the 2 posters I created for this post. In PowerPoint 2007 or PowerPoint 2010, click the Design tab. In the Page Setup group on the left, click Page Setup. The Page Setup dialog box opens. 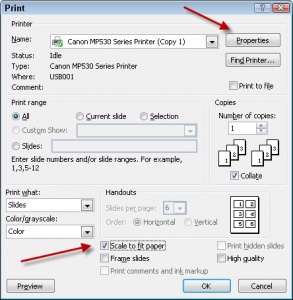 From the Slides Sized For drop-down list, choose the size of the paper you’ll use to print the poster. In the Orientation section, choose Portrait for the slides, as you see here. Your slide now looks very different from it’s typical shape and size! But now it looks more like it’s ready to be a poster. With your mouse cursor not on any slide object, right-click and choose Layout> Blank. You now have a tabula rasa, a blank slate. While we’re talking about layout, it’s a good idea to sketch your poster’s layout in advance, using regular ol’ pencil and paper. Try out a couple of ideas. Once you find something you like, creating the poster will be much easier. Posters often have a border. A border isn’t necessary, so skip this section if you don’t want one. To help you place the rectangle without obsessing over exact precision, display the ruler. On the View tab, check the Ruler checkbox. From the Home tab’s Drawing group, click the Rectangle icon. Using the horizontal and vertical rulers as a guide, drag from the upper-left corner to the lower-right corner, and release the mouse button. The rectangle is selected and you can use the arrow keys on your keyboard to move it so that it’s centered on the slide/poster. Note: If you want to create tear-off strips on the bottom, end the rectangle above the area where you will put the strips. For more information, see the heading below on that topic. In most cases, you’ll want a white poster. It’s easy to read and will use a lot less ink. To change the fill of the selected rectangle, click the Format tab, then click Shape Fill. Choose the white color swatch. Bright colors are typical for posters, because you want people to notice them. To change the rectangle’s line color, on the Format tab, click Shape Outline and choose a color. To create a double border, again click Shape Outline, but this time choose Weight> More Lines to open the Format Shape dialog box with the Line Style category displayed. Set the Width to 6. From the Compound Type drop-down list, choose one of the double line types. Home tab’s Drawing group, click the Text Box icon and drag a text box across the top of the poster. Don’t worry that it doesn’t pay attention to the height when you drag; it will adjust when you add text. When you’re done, drag across the text to select it. You should see the mini toolbar; if not, right-click the text to display it. From the Font Size drop-down list, choose a large font size. You can see the change as you pass your cursor over the different sizes. You’ll probably make adjustments, so you don’t have to get it just right yet. With the text still selected, choose a bright font color from the Font Color drop-down list. Reduce text box margin: To fit as much text on a line with the largest possible font, you can reduce the text box’s margins. Right-click the selected text box’s border and choose Format Shape. In the Format Shape dialog box, click the Text Box category. In the Internal Margin section, reduce all the margins to 0. Wrap the text where you want: Too often, you end up with 1 word on a 3rd line. Or the words wrap at a place that looks awkward or even makes the meaning unclear. Pressing Enter starts a new paragraph, which may add too much space between the lines. Instead, press Shift + Enter to create a new line without starting a new paragraph. Insert a text box and type your text. Place the cursor over the selected text box’s green circle and drag to rotate the text box. Select the text. From the mini toolbar, choose a font color that shows up well against the fill color. You can add a shadow to a text box with a solid fill, to make it seem as if it’s on top of the rest of the poster. On the Format tab, choose Shape Effects> Shadow and choose one of the options. I have more detailed information on shadows in PowerPoint 2007 and 2010 here and here. Go to Insert tab> Illustrations group> SmartArt. The Insert a SmartArt Graphic dialog box opens. Choose a SmartArt layout. For a simple list of items, try the List category. When you’re done, click OK. The SmartArt appears on the slide. Adjust the size by dragging on the corner or side handles, but remember that you can make adjustments later. It’s hard to know the right size until you’ve entered and sized all the text. I recommend using the text entry area to the left of the SmartArt. If it isn’t open, click the arrow on the left side of the SmartArt border. The reason for this is that some SmartArt requires sub-bullets to fill in the appropriate boxes, as you can see at the in the figure. To create a sub-bullet, press the Tab key on your keyboard; that indents the text. To go back to regular bullets, press Shift+Tab; that outdents the text. When your text is done, with the SmartArt still selected, click the SmartArt Tools Design tab and choose Colors. Choose a set of colors that works for your poster. On the same tab, click the SmartArt Styles Gallery’s More button and choose a style. Resize the entire SmartArt diagram using the corner or side handles until it fits your layout. You may have to resize the font. Remember that a poster needs large print so people can read it on a bulletin board, but not necessarily as large as you would use for a presentation that you display on a screen for a large audience. Is the SmartArt driving you crazy because it won’t do what you want? Ungroup it! Get instructions here. Here’s the poster up to this point. Choose Insert tab> Clip Art. The Clip Art task pane opens. In the Search For box, enter your search keywords. I entered children office. From the Results Should Be drop-down list, uncheck everything except Photographs. Click Go or press Enter. Click the image you want to insert it in your poster. I have a blog post with other resources for free photos. The figure shows final poster after adding 2 images, a horizontal line (go to the Home tab and choose the Line icon) and making some layout adjustments. Some posters have tear-off strips at the bottom, so people can take a phone number or e-mail address home with them. Tear-off strips are typical for personal posters offering something for sale or for rent. Start by drawing a horizontal line about 2 inches from the bottom of the poster. Go to the Home tab and choose the Line icon. To make it perfectly horizontal, press the Shift key as you drag. To create the first vertical line, draw a vertical line from the horizontal line to the bottom of the poster, about 1 inch from the left side of the poster. (The location will depend on how much text you want to put on the strip and how many strips you want. You’ll be cutting the strips before you put up the poster, but it’s traditional to make these vertical lines dashed. 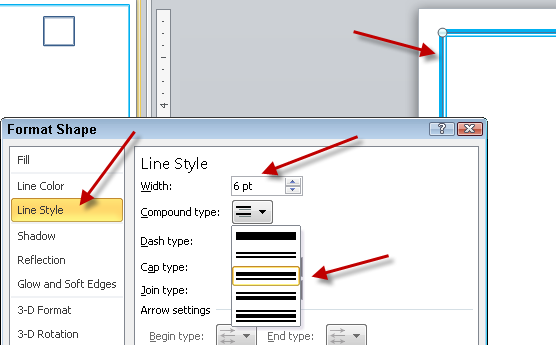 Select the vertical line, click the Format tab, and choose Shape Outline> Dashes. Choose one of the dashed line options. 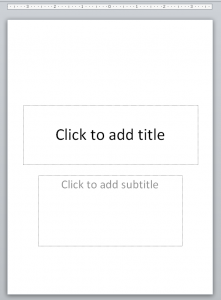 Insert a text box near the bottom of the slide. You’ll move and resize it, so the exact location doesn’t matter. Type the content you want for your tear-off strip. This text can be 12 or 14 points high. With the text box selected, put your cursor over the green rotation handle and drag around so that the text is sideways. If you hold down the Shift key as you do this, you’ll be able to get a perfectly vertical text box, as you see at the right. Resize the text box to fit the text and move it over the left-most strip. Now, you’ll duplicate the vertical dashed line and the text box. Select them both and press Ctrl + D. Use the arrow keys to move them up and to the right where the second strip will be. Press Ctrl + D again and PowerPoint remembers your spacing! Continue until you have all the tear-off strips. Make any necessary spacing and placement adjustments. Printing can be a problem, because most printers add margins around the edge of the paper by default. 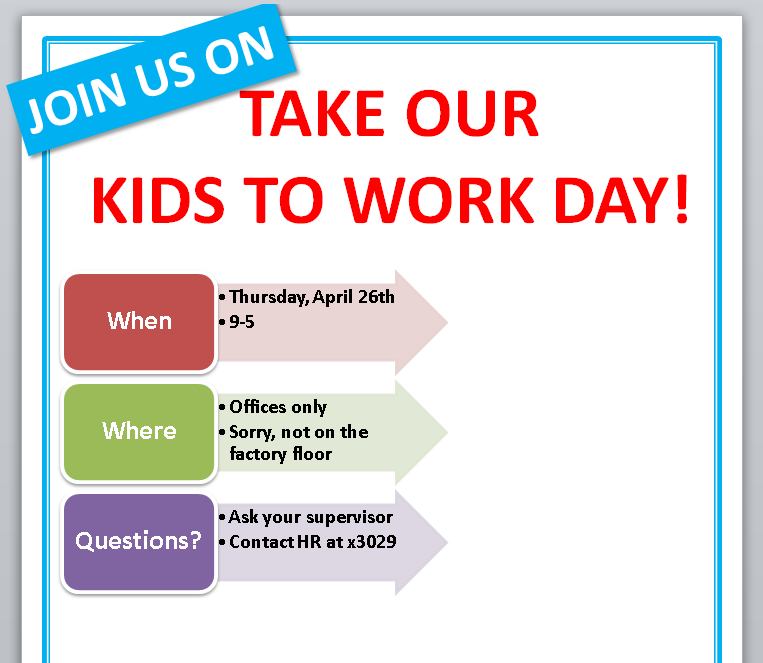 In the case of the puppy poster, that isn’t much of an issue, but for the “Take Our Kids to Work Day” poster, the “Join Us on” text box is supposed to go to the edge of the paper (called a “bleed”) and doesn’t look right with a margin. If you’re having problems printing a bleed, you can simply redesign the poster. If you really want that effect, see the 2 solutions below. Absolutely, definitely print 1 copy of your poster before printing the rest! The result might be dependent on your printer; it needs to support borderless printing. Click Application Button/File> Print. In PowerPoint 2007, you’ll see the Print dialog box. Click Preview to see the default result. In PowerPoint 2010, you’ll see the “Back Stage” area with a preview to the right. You should see a white border around your poster. Note this, because you want to see that border go away. In PowerPoint 2007, to the right of your printer’s name, click Properties. 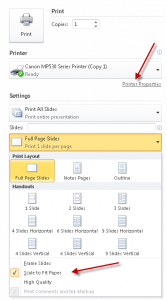 In PowerPoint 2010, beneath your printer’s name, click Printer Properties. Look for the borderless printing setting and enable it. Each printer will have somewhat different settings. Click OK to exit your printer’s properties. In PowerPoint 2007, you’re now back in the Print dialog box. Check the Scale to Fit Paper check box. In PowerPoint 2010, click the drop-down list that shows Full Page Slides and click the Scale to Fit Paper option. You should now see that the preview doesn’t have a border. Click OK or Print to print your poster. My bleed was perfect on the top but left about 1mm of white on the left. If you get a result like this and you want a perfect bleed, see the next solution. In PowerPoint, choose Application button/File> Save As. In the dialog box, from the Save as Type drop-down list, choose JPEG or PNG to save the slide as an image file. Remember where you saved it! In Windows Explorer, double-click the image file you saved and print from the default program that opens. Your printer properties need to be set for borderless printing. I tried both Microsoft Office Picture Manager and Windows Picture Viewer. When I unchecked the Fit Picture to Frame checkbox in either program, I got a perfect poster. Would you like to download some pre-made poster templates? Microsoft has a number of them online and some are for PowerPoint. Or download a Word template, open it, copy everything on the page and paste it into PowerPoint. You may need to resize individual objects to fit. But I have to say that I thought that most of the online templates weren’t helpful for the type of poster I would need to create. I’ve turned the posters I created for this blog post into 2 templates that you can download for free, with registration. Click here to go to the sign-up page to get the downloads! Love this. Wouldn’t even think to do a poster in powerpoint. Glad you like it! Apparently, it’s a fairly common search. I’ve usually done them in Word, but placing pictures in Word can be such a pain, unless you know the secrets of image wrapping. So after creating a couple in PowerPoint, I think it’s the best tool. I’ve been doing all kinds of quick design work with PowerPoint for years and for the very reason you stated: “…placing pictures in Word can be such a pain…” even when you know image wrapping. It’s especially handy when I don’t want to take the time to start up my Mac and then wait for one of the CS programs to open. PowerPoint is a really handy go-to and one of my favorite simple programs. Thanks for the nice tips! My wife and I are selling our pub table and chairs. 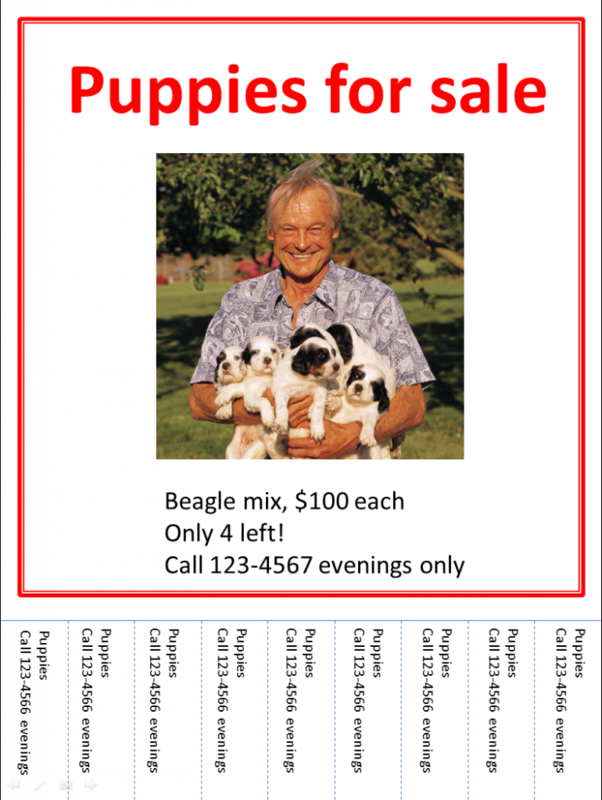 We will certainly use PowerPoint to create our for sale posters. What a great set of helpful tips. Will use to generate our 2013 posters for our 20th annual Tri-County Science & Technology Fair. 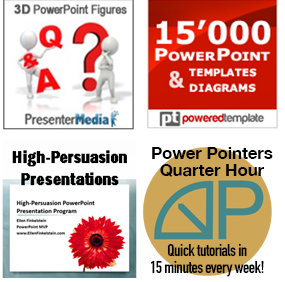 Have used word, but PPT is so much easier to incorporate graphics, angles and overlays. I’ve used PowerPoint to create posters and big graphics elements for trade show booths – we used a wide-bed printer in our engineering shop and laminated the results to heavy stock/board or transparent plastic at a local print shop. Some of these are 8 ft high and form walls of the booth! If you don’t have access to a big printer, a print shop might be able to produce results but you may have to (carefully) convert the PowerPoint to jpg or png. By the way, you can produce trade show video displays with PowerPoint too. PowerPoint is often used to create very large, complex posters for scientific conferences. They have a mixture of text and images so jpg and png are both compromises and can be huge. Saving as a pdf works best in this situation, although some commercial printers will print directly from PowerPoint. Saving to a PDF is a good idea. It’s probably more reliable for printing. I love PPT very much, thanks for the tutorials. Love it..
Once/year I use PPT to make a 10′ wide poster for a conference. Because of its large size I have to keep moving around to different parts of the slide and work on that section while it’s enlarged, alternating with making it “normal” size so I can get “the big picture.” It’s a bit of a pain, but worth it. At the end I convert the slide to a pdf, and give the place that prints it for me both the original PPT file and the pdf. Couldn’t live without PPT!